Norfolk, Virginia has a major base of the U.S. Navy, which takes climate change and sea level rise very seriously. 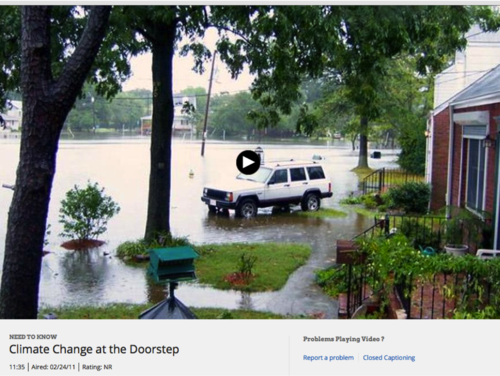 This video offers a case study of a community where sea level rise is already an issue and a glimpse of the related social and infrastructure issues. Comments from expert scientist: It mentions both land-ice melt and thermal expansion of water as drivers of sea-level rise. Resource includes the role of local subsidence (Norfolk, VA is built on drained wetlands--easily compressed compared to bedrock). This video offers viewers an example of how climate change impacts a community through sea level rise. Can be used to spark discussion and further research. A good complement to other CLEAN sea level rise resources. The video is of good production quality and can be embedded.